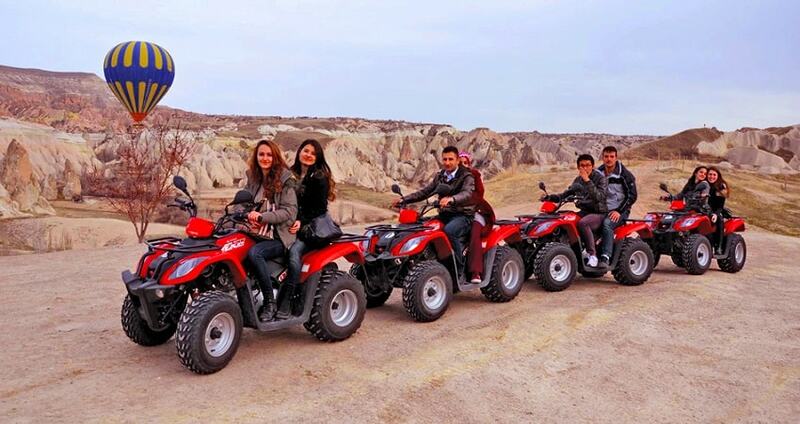 While there are multiple ways to explore Cappadocia, the Quad Safari is probably one of the most exciting. 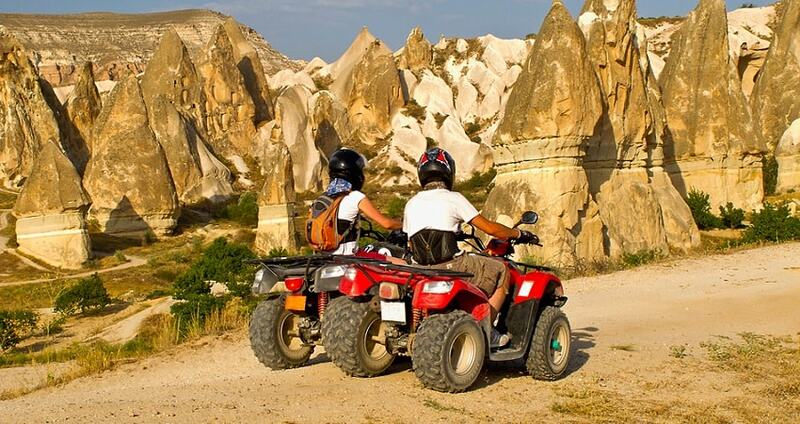 Get to know Cappadocia’s surroundings and incredible valleys with an adventurous and alternative excursion. 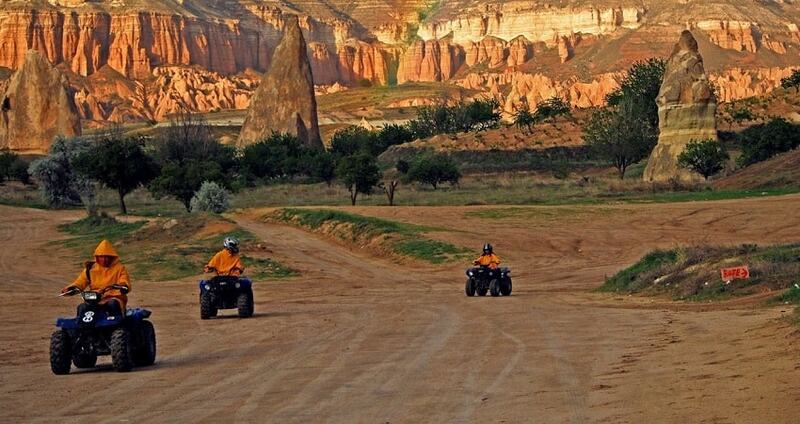 Cappadocia Quad Safari provides a 2-hour fun exploration of some of the most interesting sights. You will be able to tour around hills, valleys and villages. In addition you can observe the spectacular rock formations, fairy chimneys, cave houses and churches. Beautiful landscapes and unique natural beauties is what you should expect from your Quad Safari excursion. Depending on the scheduled time of your excursion, you will be picked up from your hotel and with a comfortable vehicle you will arrive at the point where the Quad Safari starts. It is important to mention that this Quad Safari excursion can be done during sunrise, daytime or sunset time. By the moment you arrive there, you will have the chance to meet the professional Quad Safari instructors. An introductory briefing will take place as instructors will let you know how to control and drive the quad bike. In addition, they will demonstrate how to use the safety equipment. The tracks are easily accessible therefore no prior experience is needed in order to participate. Once you are ready, the real adventure starts! Together with your instructor you will start the exploration of the area. The first destination will be the Love Valley. Once you arrive there you will be impressed by the peculiar rock formations that the valley has. More precisely, the valley was named after the famous rocks that look like phallic mushrooms. Make sure that you will take some photos as the scenery is spectacular. 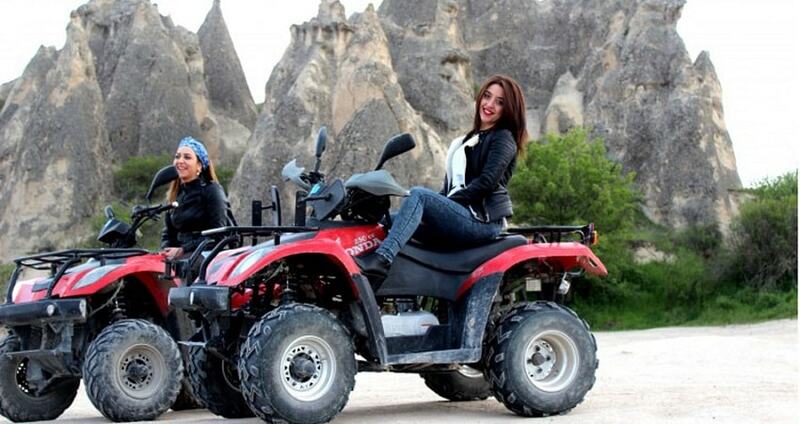 Cappadocia Quad Safari continues towards the Rose and Red Valleys. These locations are perfect for panoramic photos of the rock formations. In addition, you can observe tracks that connect the valley with small villages and towns that look like a spider web. The next stop will be made at the Sword Valley which is known for the fairy chimneys. This valley is the smallest in Cappadocia. 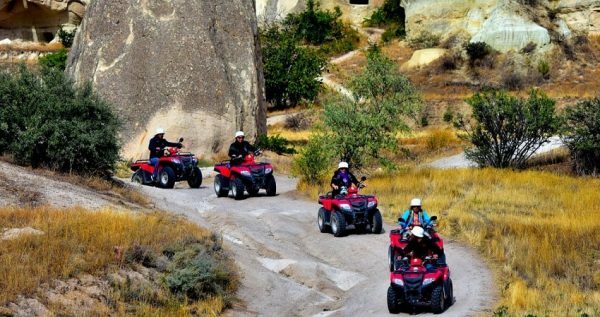 Cappadocia Quad Safari has a last stop in Cavusin village which is an old Greek village. There you can observe and take some nice photos of houses that are carved into cliffs. The village is also known for its castle. After your short stop at Cavusin, you will continue on your way back to the Quad Safari station where a vehicle will be waiting to drive you back to your hotel. This fascinating 2-hour excursion will boost your adrenaline while it offers you the necessary photo stops for the main attractions. 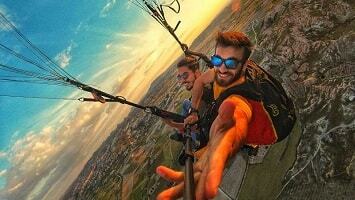 Cappadocia Balloon Tour is a very popular tour in town, please follow the link for the details. Explore Cappadocia’s main attractions by participating in an alternative, yet exciting Quad Safari tour. This 2-hour excursion is ideal for those who wish to explore the famous valleys of the region and boost their adrenaline. Enjoy spectacular views, amazing fairy chimneys and rock formations within Cappadocia Quad Safari excursion. 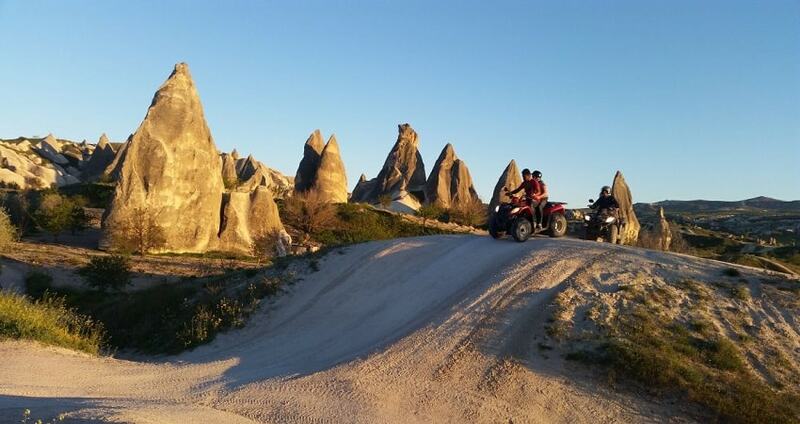 Cappadocia Quad Safari excursion can be conducted during sunrise, daytime or sunset. Depending on scheduled time of your excursion, a vehicle will pick you up from your hotel and drive you towards the location where the Quad Safari starts. 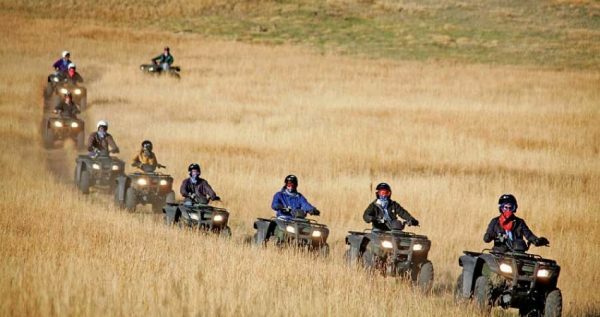 The quad bikes that you are going to use during your adventurous exploration are completely safe as they meet all the safety standards required for such activity. 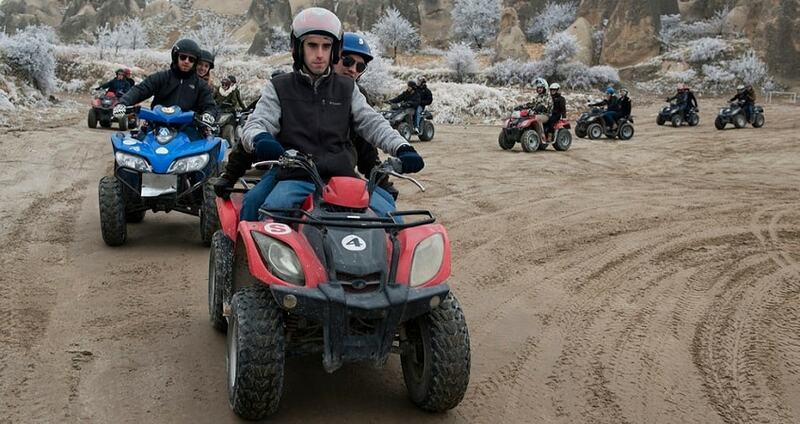 Due to the fact that the quad bikes are automatic, it makes them really easy to use and control. When you arrive at the Quad Safari departure point, you will meet the instructors. They are in charge to ensure that you are having a smooth and pleasurable experience. The instructors will proceed with an introduction on how to use and control the quad bike. In addition, they will let you know the basic safety rules and distribute the necessary safety equipment. This 2-hour Quad Safari requires no prior experience, as instructors will explain everything you need to know. Once you are all set, the adventure begins as you will be driving your quad bike towards your first destination. In general, you are going to ride the quad bike and visit several valleys. At first, the destination will be Love Valley. Rock formations of different shapes compose an amazing setting. During your short break, make sure that you will snap some nice photos of the valley. 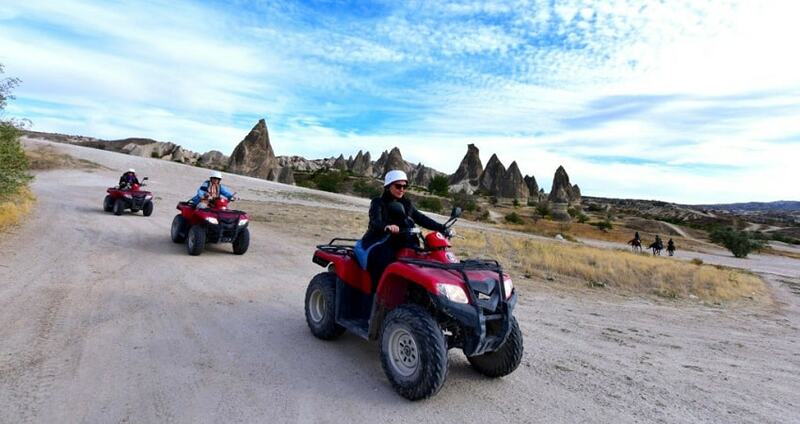 Then, Cappadocia Quad Safari continues towards the Rose and Red Valleys. A short stop will be made there in order to observe and admire these amazing locations with the spectacular rock formations. The exploration continues towards Sword Valley which is the smallest in Cappadocia and is known for the infamous fairy chimneys. After your charming and adventurous exploration in the valleys of Cappadocia, a final stop is scheduled to be made at Cavusin village. This particular village showcases an interesting character and charm as it used to be a village that a Greek and a Turkish community used to live. There, you will be able to see houses and churches carved into cliffs. By the end of your last stop, you will drive back to the Quad Safari station. A vehicle will be waiting for you in order to drive you back at your hotel. 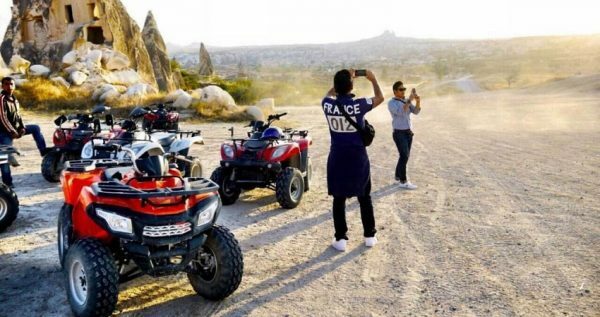 This 2-hour adventurous Quad Safari excursion forms an exciting way to explore Cappadocia and by the end of your tour you will be impressed by the images and the adrenaline. Full with emotions and some adrenaline boosts, the off-road experience comes to an end. The Jeep Safari excursion ends by the time you arrive back to your hotel full of new memories.